Many of New York City’s teens are dealing with serious issues such as drug addiction and sexually transmitted diseases in silence, without access to healthcare. Young people need a safe environment where they can gain the knowledge of how to care for themselves and receive treatment. That’s where physicians like Dr. Bob, as he is affectionately known, come in. 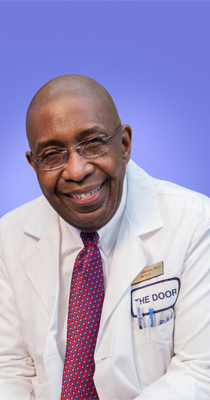 In the early 1970’s Dr. Robert Johnson was one of only three physicians in New York City trained in adolescent medicine, an emerging field to address the issues that pediatrics weren’t equipped to deal with. Naturally, he came to The Door. Dr. Bob and the Adolescent Health Center have always been proponents for providing youth with accessible healthcare. Your generosity ensures that New York City’s youth can receive the care and support they need to stay health. Make your gift to The Door today.